Are you coming home to Notre Dame for Alumni Reunion? As you begin to make your alumni reunion plans this weekend, please be sure to add the College of Science to your weekend itinerary. 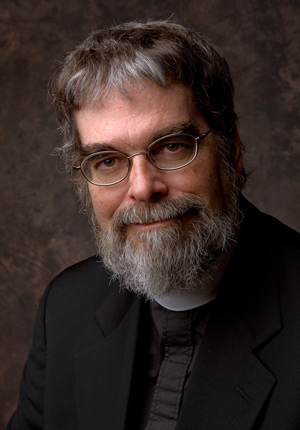 Brother Guy Consolmagno, S.J., astronomer and president of the Vatican Observatory, will speak on his career in science and faith at 7 p.m. June 16 (Tuesday) in the University of Notre Dame’s Jordan Hall of Science. Brother Consolmagno’s lecture, “Would You Baptize an Extraterrestrial?” will concern this and similar questions addressed to him in emails and letters he receives in the course of his work. University of Notre Dame researcher Mike Ferdig is part of team of researchers who have demonstrated that so-called “humanized” mice can be an effective model to study parasites that cause malaria and resistance to malarial drugs. Their study appears in the June 1 edition of the journal Nature Methods. For the fifth consecutive year, the Center for Mathematics at the University of Notre Dame is hosting its summer thematic programming. This year’s three-week program focuses on boundaries and dynamics. Kelsey Kremers, a graduate student in the Department of Biological Sciences, has earned a NASA Earth and Space Sciences Fellowship for her proposal, “Is arctic greening consistent with the temperature sensitivity of coupled carbon and nitrogen cycles?" The fellowship is very selective—only 64 fellowships were funded out of 391 applications this year. This summer, business major-turned physician, Dr. David Gaus, helped to open Hesburgh Hospital on behalf of Andean Health & Development, a nonprofit aimed at providing quality and sustainable healthcare for rural poor in the Ecuador. Through the inspiration of Fr. Hesburgh, Dr. Gaus attended medical school and determined to use his degree for good: by providing residents of rural Ecuador affordable, accessible medical care. In 2000, he founded the Pedro Vicente Maldonado. Since then, the hospital has treated more than 75,000 patients, including 2,500 childbirths, 1,200 surgeries and 7,500 emergencies. During Commencement season 2015, the Graduate School bestowed four prestigious awards: the Distinguished Alumnus Award; the James A. Burns, CSC Award; the Director of Graduate Studies Award; and the Graduate Administrative Staff Member Award. The Graduate School at the University of Notre Dame is pleased to announce the winners of the 2015 Eli J. and Helen Shaheen Graduate School Awards. 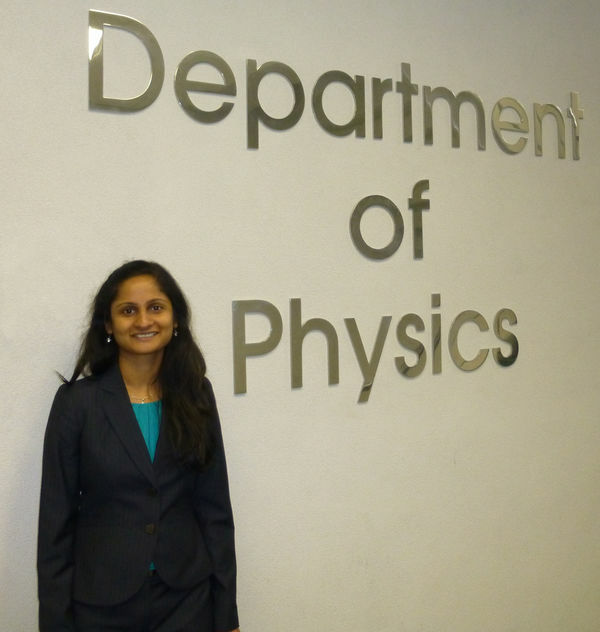 This year, two students from the lab of Prashant Kamat, the Rev. 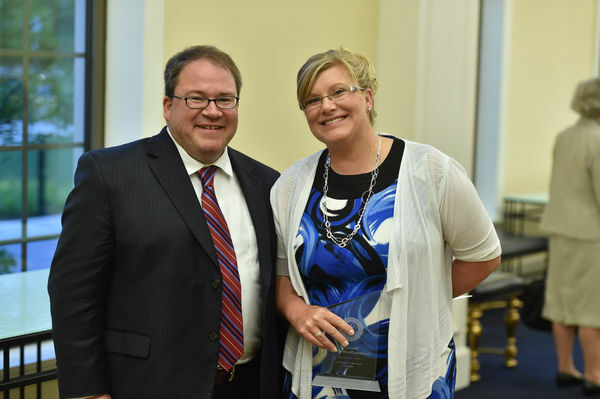 John A. Zahm Professor of Science, were honored with Shaheen Awards. The Undergraduate Summer School hosted by the Center for Mathematics at Notre Dame attracted more than 30 students from around the world to hear talks from leading mathematicians and network with faculty and fellow students. The event, May 19-22, is the first of three related gatherings in a thematic program that has been organized by the center each year since 2011. This year’s organizers were François Ledrappier of Notre Dame, Françoise Dal'Bo of the Universite de Rennes in France, and Amie Wilkinson of the University of Chicago. It is one of the fundamental questions that remain unanswered in astrophysics: What are the progenitor stars of a “type Ia” supernovae? 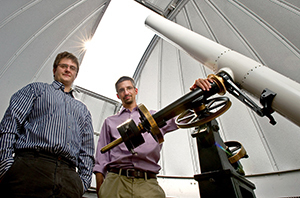 A new paper in the journal Nature by University of Notre Dame astrophysicist Peter Garnavich and a team of researchers describes how they used the Kepler Space Telescope to catch three stars in the act of exploding. The results shed light on which stars generate these energetic outbursts. A team of Notre Dame entrepreneurs has developed a sleep-enhancing kit and app designed to boost college students’ healthy rest, memory, learning, and mental health. The approach is based on the research of Jessica Payne, the Nancy O'Neill Associate Professor of Psychology and director of the Sleep Stress and Memory Lab. Matt Berg, who received his undergraduate degree in science-business in 2012 and master’s degree in the entrepreneurship master's program (ESTEEM) in 2013, and junior Ryan Gannett work with Payne. Their company, Somni, has launched a Kickstarter campaign to raise money for kit manufacturing and app development. Through a multidisciplinary approach, the sustainability minor at Notre Dame prepares students to serve as leaders in their communities by making constructive and substantive contributions to the development of more sustainable practices for the benefit of their own personal and professional lives, the lives of others, and the lives of future generations. As part of the minor, students are required to complete a capstone project of their choice during their senior year. Shella Raja, a biological sciences major, and double minor in anthropology and sustainability, took a unique approach to her project and decided to incorporate a community service component with her research. The top graduating seniors in the College of Science were honored at the annual Dean’s Awards Luncheon on Friday, May 15 in the Jordan Hall of Science. Gregory Crawford, William K. Warren Dean of the College of Science, presented the Dean’s Award and Dean’s Research Award and the chairs of each department recognized the top students in each of their majors. In addition, Anthony Hyder, professor of physics, was awarded the Shilts/Leonard Teaching Award. NDnano is pleased to announce that the center has awarded NDnano Undergraduate Research Fellowships (NURF) to several students for the summer of 2015. The students will work with the research team of an NDnano faculty member on a 10-week project in nanoscience or nanoengineering. "The NURF program is a highly competitive international program that provides aspiring engineers and scientists the rare and exciting opportunity to collaborate with world-renowned nanotechnology researchers on projects that may ultimately contribute to products and solutions that yield significant societal benefits," commented David Balkin, Ph.D., managing director of NDnano. "As always, we look forward to seeing what these great students will accomplish over the summer and are excited to provide fantastic experiences that can significantly influence participants' future career directions." An inaugural survey examining how corporations are addressing the need to adapt their business operations to changing climate conditions reveals that 30 percent already have experienced a material impact to their business operations from climate events. It also found that 30 percent of respondents across a wide range of sectors don’t have a climate adaptation plan or strategies in place. 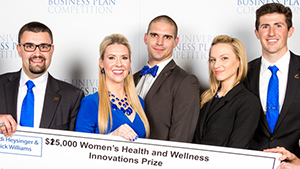 Enlightened Diagnostics, a startup company run by students from the University of Notre Dame, won three prizes and $19,000 at the 2015 Rice Business Plan Competition, the largest competition of its kind in the world. Last Friday, May 1, the ninth annual College of Science Joint Annual Meeting (COS-JAM) was held in the Jordan Hall of Science, featuring 186 student authors/coauthors presenting on 138 projects. 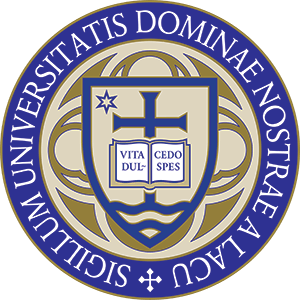 Twenty University of Notre Dame faculty members have received Rev. Edmund P. Joyce, C.S.C., Awards for Excellence in Undergraduate Teaching, and three have been honored with Dockweiler Awards for Excellence in Undergraduate Advising. Six award winners are from the College of Science. The students from Scientia, the undergraduate journal of scientific research, host a monthly seminar series called Talk Science that highlights the work of undergraduate and faculty researchers at the University. 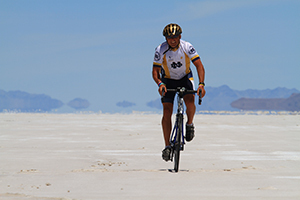 This semester, Talk Science events focused on research that can be applied in innovative ways. April’s presenters were senior physics major Katrina Magno and Marya Lieberman, associate professor of chemistry and biochemistry. High school and grade school students from around the country will be able to experience the life of a Notre Dame science student for a week this summer. The Notre Dame DNA Learning Center will hold week-long residential camps this summer for students who are entering grades 8 through 11, and day camps for students who are entering grades 7 through 10. 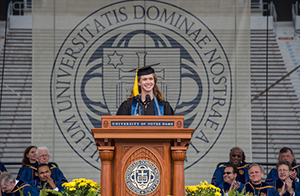 Anna Kottkamp, an environmental science major from Wenatchee, Washington, has been named valedictorian of the 2015 University of Notre Dame graduating class and will present the valedictory address during the University Commencement Ceremony on May 17 (Sunday) at Notre Dame Stadium. Thirty-two winners of the Internal Grants Program Awards, including five faculty from the College of Science, were announced today by Notre Dame Research. The grants were awarded to faculty from five colleges and schools in three categories: Faculty Research Support (Initiation), Faculty Research Support (Regular), and Equipment Restoration and Renewal.